Happy Friday:) Looking forward to a fun Saturday with my honey. But first I want to share this card with you. I saw the fold on Pinterest and loved it...this is my version. We have the new stamps "Fall Harvest" at Sparkle N Sprinkle and the new Velvet Glitters...so what else is a person to do but put them together??!! lol I used a Super Adhesive Sheet and layed a piece on my Vanilla cardstock big enough for the Spellbinders Circle Die, then cut it out and covered it with Cloud Nine Velvet Glitter. Then I stamped the pumpkin with Versamark and embossed with Moss EP. Then I got to color with my Copics!! This glitter is so soft and smooth that you can color easily on the glitter (just be careful when you emboss that you don't color over the embossing lines, but within the lines so you don't bleed the color of the embossing). I even used my Warm Grays to shade with. The sentiment on the outside was stamped and embossed with Cordial Red EP. The designer paper came from Authentique. 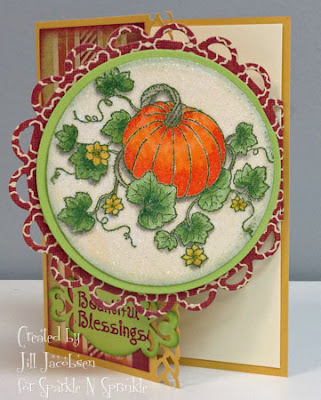 Then on the inside I just stamped with Memento Peanut Brittle and Morocco inks. The border punch is an EK Success punch. 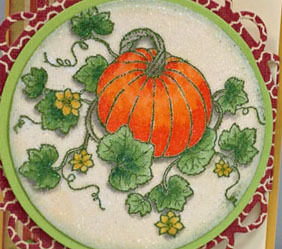 The pumpkin is layered on the Lacey Circles. This is gorgeous!! Love the unique take on a joy fold card and you coloring is fabulous. Another beautiful card. Love the fold! Beautiful card. Your pumpkin looks fantastic, especially on all that lovely glitter. Your card is beautiful! I love how you used the frame to open up. Your coloring is great!